The Lahore University of Management and Sciences (LUMS) offered admissions in 2018. If you want to get enrolled in this one of the top management universities in the world, then it is a great chance for you. LUMS Lahore will offer admissions in graduate, undergraduate and doctoral degrees in different majors like biology, Computer Science, Chemistry, MBA, Electrical Engineering and many others. As LUMS university Lahore is going to offer admissions in many top programs and courses. The university is achieving and sustaining excellence in every era of teaching, research and technique. Here you can find out the details about the LUMS Lahore eligibility criteria, fee structure, short courses 2018, last date of form submission, entry test date, merit list date, scholarships, jobs and the programs offered by The Lahore University of Management and Sciences. The LUMS University was founded in 1985 and up to the current times it is counted in the list of most leading and top ranking business universities in Pakistan. 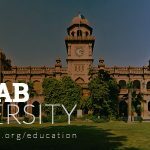 Lahore University of Management and Sciences is a leading institute in the department of business and you can take admission in different programs like MBA, BBA, BSCS, BS Biology, Chemistry, Electrical Engineering and in P.hD of different programs. 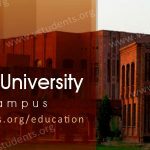 Find complete information about LUMS fee structure and Short courses 2018 below. The institute invites you to take admission in LUMS that will provide an excellent way of studies of international standard. The university also houses a special Java lab and sunray appliances and library consist of thousands of books. The institute is offered a residential area of modern standard and state of the art apartments for its faculty members. The students of the institute receive a comprehensive education, including frequent tutorials and are taught by collegiate leaders in their squares. Don’t forget to apply for Virtual University Admissions in MBA, BBA, M.COM and other business fields. Find all the knowledge at your home. Following fee particularly applies to the student tuition fee. 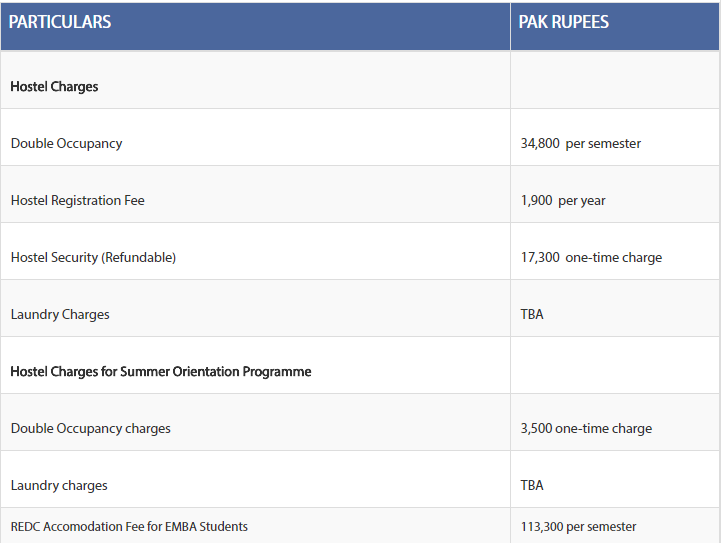 LUMS overall fee structure for hostel residents is given below. 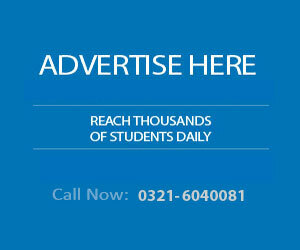 LUMS admission fee, registration fee and fee for the reading material can be checked from this link. Online application deadline for UG continuing student is below. Online Application Deadline (PST): 30 Jan 2018. SBASSE Subject Test administration: 18 Feb 2018. 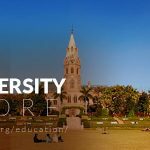 Deadline to take SAT (Second Round Offers): 10 March 2018. 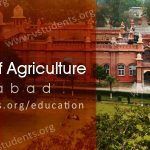 Also seek admission in ITU Lahore, and Arid Agriculture to your desired engineering or non-engineering programs they are offering in 2018. There are multiple skill based and interest-based courses offered by LUMS administration. English, Arabic, German, Chinese language courses. Graphic designing, SEO, Content Marketing, and Creative Writing. Interior Designing, Organic Gardening, Photography, Pottery. 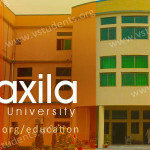 Singing Classes, Film Making, Video content for electronic media, Astronomy, Painting, and more. Here is the step by step guideline about LUMS online admission form submission process. Exactly follow the steps to apply for undergraduate, graduate or master level programs. 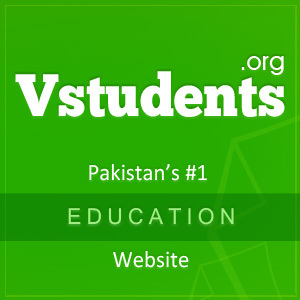 Go to this link for applying online admissions.lums.edu.pk. Click on the degree program you want to apply. 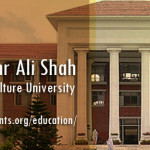 Log in/sign up for your lums account. A form will appear. Carefully fill all the required fields. Submit the application form and wait for the further updates. 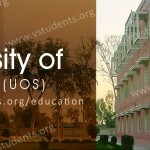 The organization announced the entry test date as well as merit list date which will conduct by the university. Please follow the link Here for the recently announced entry test dates by the Lahore University of Management Sciences. Deadline for SAT is 10 March 2018. BSc Economics, BSc (Honours) Economics and Politics, Political Science, Anthropology, and Sociology, Accounting, and Finance, Management Science. BA (Honours) English, BA-LL.B Programme, and History. Ph.D. Computer Science, Biology, Chemistry, Electrical Engineering, Physics. 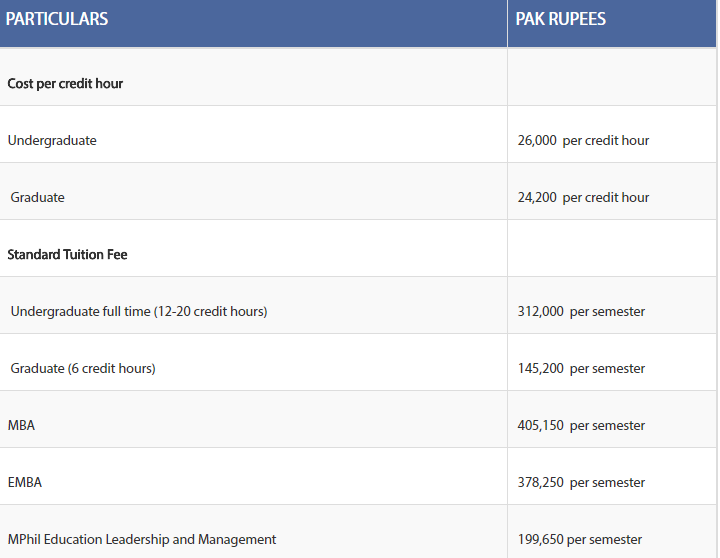 Following are the admission requirements for LUMS undergraduate, graduate degree level programs. 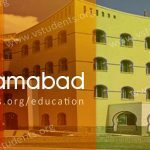 LUMS undergraduate admission eligibility conditions can be checked here. To find graduate admission criteria kindly go to the link here. Financial Aid at the university is based on need and merit. The scholarships are typically awarded on merit or extremely high need according to the laws. Normally a combination of economic assistance comprising loan and tuition waiver is offered to candidates. For all the information go here.